Being on semi-down time, I thought I would post a pic or two. First pics are some of the upper cabinets on a kitchen I am making from maple veneer core plywoods and solid poplar facings, tongue and groove backs. The style has become one of my favorites as in my opinion they are timeless. I really like the wooden muttins on the glass doors and I like the curved detailed bead mouldings, simple yet kinda elegant. Now overwhelming in decadance but regal?......there are two of them, one right, one left mirror images that go on either side of the window above one of the sinks. An 1 1/2” above the door will be a 3/8” dia bullnose and 1” above that will be crown mould. 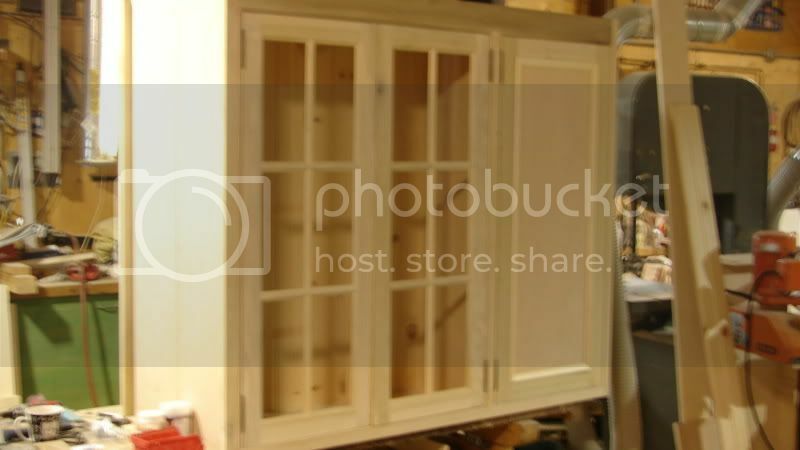 Another 5/16” bead will trim around the base of the cabinet followed by a light valance having bead mould on the bottom. ........anyway. There is a secondary shelf behind the bottom of the door and a recessed door stop behind the top of the door, both set back 1/8+ so that an earth magnet and bumper can be installed to ensure the door opens and closes easily and stays shut, flat and even. Both get glass shelves with a wooden mould attached to the front so that they look like wooden shaelves and yet the glass lets the lights installed inside, light up the whole interior. The finish is yet to be decided but regardless, I think once its distressed, stained and or painted and rubbed out…............it should look pretty good. and another with glass doors, two of them being mirror images that go on either side of the oven/range top and has a custom 4’ wooden hood vent between them. All the uppers get detailed similar to above. Great looking cabinets roman! Your attention to detail shows your craftmanship well! Hope your finger is doing better. Roman, these look good. And thanks for the story behind the cherry cabinet. I am glad to hear you are on the mend. It will take some time but you are in our thoughts. Our family recently had a health scare with my mother and it was a rude reminder to cherish what time we have left with older family members. As a remodeling contractor I really appreciate the great design and plywood construction. The “finger” is now down to dull roar unless I accidently tap it, then the pain goes through the roof. Gives me a chance to catch up on drawings and finish my front hall and ceiling. Next. 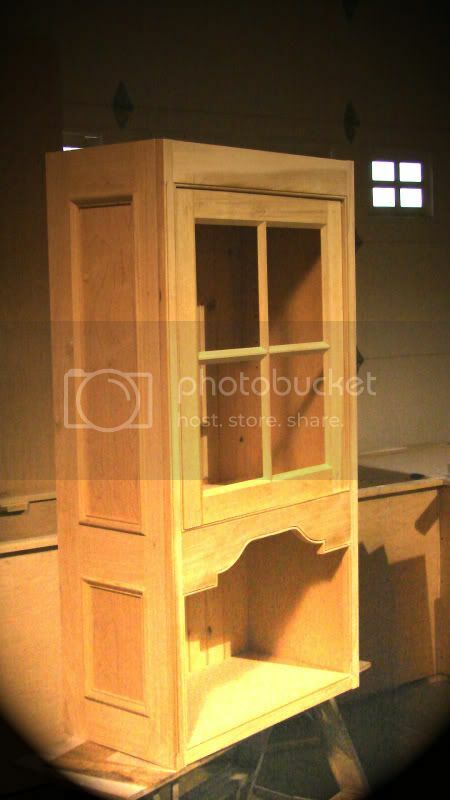 Similar in details but done in rift sawn white oak for a desk, built in bookcases,trim, files drawers and a mantle. a really, really, big project that I hope to stretch over 2 years. Hey Roman, wanna come out and play a little catch? – Just kidding. Very nice attention to detial my friend I like the beading you do on these pieces. Very clean look to the style. Thanks Bob#2….....I’ll pass on the catch. I tried playing goalie recently…..........bad move. I like beading, its a small detail that says a lot. Not loud and yet suttle decadance mind you, mitering the frames with beading as part of the frame, I find very slow going.I saw a tool at the trade show, that cut it quick and easy,punched a hole for a hidden bowtie plud…...in a snap!!! !............but it was about 8 grand and then, like now…............I didnt have 8 grand and I didnt do enough of it to warrent spending that kinda money. Now it seems every project has it so I would love that tool. A lot of dovetailing in this project too so I broke down and bought another dovetail jig, made by Festool. A review will be coming soon. I was up at 3:30 am today, working by 4 am and the island just needs a final assembly, then broken down…............done!!!!!!!!. Oh ya, a little sanding yet. I love the beading too, I see you’re working through the pain. Right on, sign of a real nut case. 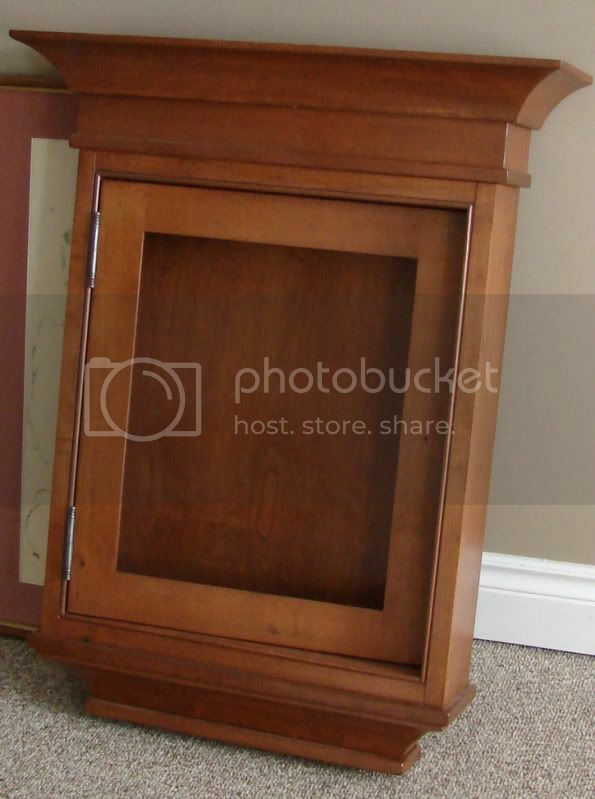 Reading the blog about doing the cabinet for your father. How did that go? Two or three weeks ago, I finally gave it to my brother in law to give to my Dad for Christmas. Sadly I couldnt be there to see his face but I am told that he got quite emotional and really loved it. Hummph. I look at the beaded haunched joinery on the above pieces and at the time they were made, I would have never believed what I know now. If stranger came up and told me what I now now, I would have been short with them, told them to …..You know, “get out, thats BS”. Surprising how the mind keeps changing. How the mind has to adapt to an ever changing world and all its challenges. About 8 years ago I heard a reputable tradesman who specialized in precast architectural concrete. (I even had the privilege of working for him) tell me, they were building everything that was made from wood, plastics, stone, right on the job site and get this “with hand tools”. Ya, sure they are. BS. and it dawned on me, that the man who was telling me this, a precast custom concrete mfg’r does not build parts for a man who builds a shabby humble folks home. These are multi-million dollar mansions and I had to ask my self “How can this be? “ How can somebody jump into a job site withy “Timmy toys” and produce what I do, when I have a huge shop, a 30K table saw, big bucks and a heavy investment into real estate and steel. …….How could this be true ? I found Festool and in fact thats wrong cause Festool found me. A little ground work and a site visit showed me they had Festool and a table saw. So I researched Festool, watched U tube, did my homework and over the next couple years, I learned a lot. I learned that its entirely possible to turn out a high end product quickly, efficiently, on time, on budget or at least I had convinced myself this to be true. I mean how could it be wrong as others were doing it. What it required was an exceptional amount of in shop, in house, professional experience, just whacking away the hours staying focused on doing things right. I proceeded to have the intestinal fortitude to shut a shop down and walk away from a significant personal, emotional, and financial investment. I knew I would loose, at least for a short time, a significant amount of money. It’s easy to be part of a crowd and its exceptionally hard to stand alone. The Festool in combination with a TS and a few others. I got no issues and with 100% certainty, that I have a major competitive edge over almost everyone……………..and I’m starting to like it. Thinking out of the box, it’s not a popular, period. It’s not. Don’t believe me then try messing with the recipe of the coffee machine at the shop. My point is that often we get labels when we jump on the circle of life. The circle equals doing the same thing, everyday after day after day until we die. Nothing wrong that and am a fond lover of routine but most often you get labelled and woodworkers get cheated. Cheated because at the end of the day, we get to fix every single sub trades BS. Thats a fact and after enough experience it gets tiring hearing the BS. As the career moves forward, the lessons learned are immense in avoiding the inevitable phoque up. Its avoiding as many as possible that increases the bottom line. Its seeing problems before they become problems and having solutions to them that count. It’s not an easy thing as some building become quite complex, be it plumbing, HVAC, Electrical, Tile, Stone, the engineering, t……………….its a flippen big whack of info. Thats where you get labelled, where if all you do is make cabinets, furniture,………..thats all people will eventually,……….let you do. If your happy there then you have reached Nirvana and I wouldnt rock that boat but if you ever wanted to get more involved with design, with big timbers and big braces, way more doors, fancy ceilings, fancy finishing, fancy panelling, haunched beaded face frames, furniture like built ins …………….its hard to get off that circle of getting up everyday, on time, eat kiss, public transit routine. Do it now and a bit of advice, take it or leave it. Funny how life is and looking back. I remember being so proud of getting my first commission. It was a tall firewood box with fingerjointed corners. It took a week to squeeze the 300 bucks from the palm of that woman and it took a week to make it, the material costs, after all mistakes, was over 700 bucks. …FAIL. I never gave up and continued learning similar lessons but the funny thing is, is that the mistakes starting dissappearing, the budgets got bigger, the BS got smaller, and am now at the point where, “touch wood” use my Festools toys and pick and choose what I want to make, it stops the boredom of solving other problems.